​Fairfax Media’s Michael Bachelard and Kate Geraghty have won the Gold Walkley Award​ for their extraordinary work, “Surviving IS: Stories of Mosul”. The ancient city of Mosul’s devastation by Islamic State may feel unthinkably tragic and distant, but Michael Bachelard and Kate Geraghty told visceral, personal stories that helped readers gain insight through a common humanity. Visiting hospitals, mass graves, military bases and homes, Bachelard’s stories introduce us to people who are resilient, yet exhausted by the ravages of war. Geraghty’s visuals help immerse readers into the atmosphere of a city and a situation far from our understanding. Michael Bachelard is the editor of The Age investigations unit and the foreign editor of Fairfax Media. Bachelard began his journalism career at The Canberra Times in 1990 before moving to Melbourne with roles at The Melbourne Times and The Australian. In 2006 he joined The Age investigative unit, then The Sunday Age, and served as Fairfax’s Indonesia correspondent from 2012 to 2015. Bachelard was executive producer of the Phoebe’s Fall podcast, and authored The Great Land Grab, and Behind the Exclusive Brethren. After wins in 2010 (Business) and 2015 (Print/Text News Report with Armando Cordoba), Bachelard is now a four-time Walkley Award-winner, including this year’s Gold. Kate Geraghty started her photographic career in 1997 at The Border Mail. She joined Fairfax in 2002 and since then has covered the Bali bombings; the 2003 invasion of Iraq; stories in Afghanistan; war in Lebanon; the 2004 tsunami; Sexual violence in DRC; war in East Ukraine and the downing of MH17; the refugee crisis in Europe; the independence of South Sudan and following civil war; the drug wars in the Philippines; and the liberation of Mosul. Geraghty is no stranger to the Walkley stage, having been named Press Photographer of the Year in 2007 and 2013, and winning the photographic essay category in 2006 and 2007. Kate Geraghty was also named this year’s Nikon-Walkley Press Photographer of the Year for a body of work that included coverage of the frontlines of Mosul, the war on drugs in the Philippines, the famine crisis in South Sudan, and Australian Vietnam War veterans who have retired to their old battlegrounds. Former political editor for The Age, Michael Gordon, won the the Walkley Award for Outstanding Contribution for his groundbreaking reporting, fair leadership and and generosity over 44 years in the industry. You can read the full tribute to Gordon here. The Walkley Documentary Award went to Martin Butler, Liz Jackson, Bentley Dean and Tania Nehme, for “A Sense of Self”, and this year’s Walkley Book Award went to Louise Milligan for Cardinal: The rise and fall of George Pell. 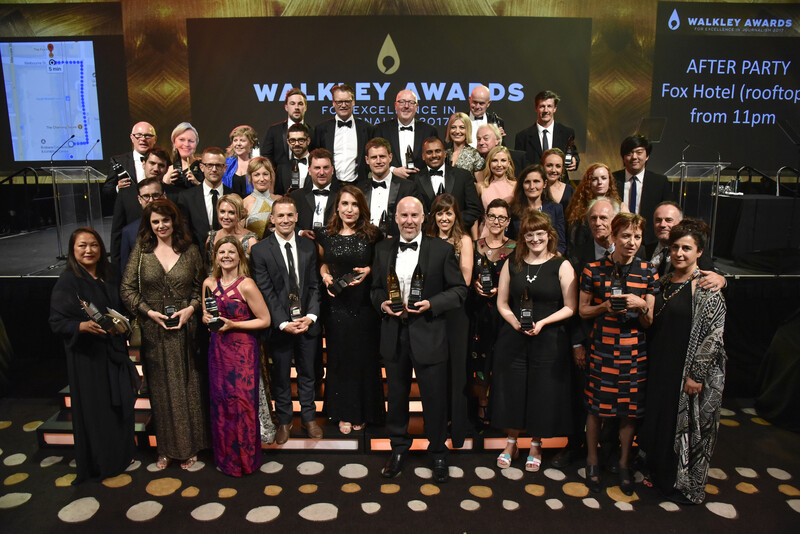 The 62nd Walkley Awards for Excellence in Journalism were presented in 30 categories. Just under 600 journalists and media identities gathered in the Plaza Ballroom of Brisbane’s Convention and Exhibition Centre for the gala event hosted by Lisa Wilkinson. The Walkley Awards were held in Brisbane with the support of Tourism and Events Queensland. The full list of winners is published below and in the December issue of The Walkley Magazine.